Buckwheat bite-sized pieces with cinnamon and nutmeg - perfect healthy snack for children! 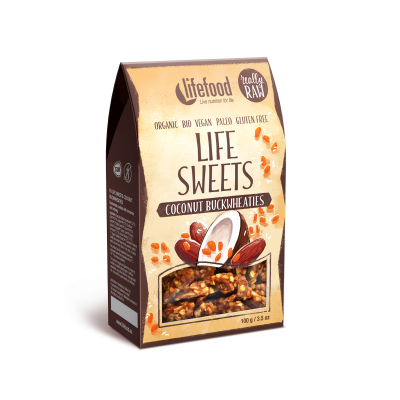 Lifefood Coconut Buckwheaties are delicious granola-like bites perfect for breakfast or as a snack. 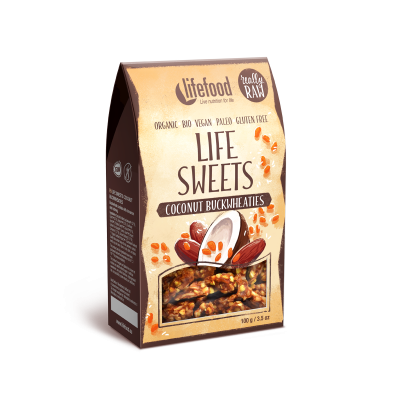 These truly raw coconut Buckwheaties are sweetened with dates and raisins. Such an interesting combination of ingredients enhanced with a touch of cinnamon and nutmeg. A great alternative to cereal bars. Germinated Buckwheat* (32 %), Dates* (23 %), Raisins* (12 %), Sunflower Seeds*, Pumpkin Seeds*, Coconut* (8 %), Golden Flax Seeds*, Lemon Juice*, Ground Cinnamon* (0,7 %), Ground Nutmeg* (0,1 %).